National Disability Employment Awareness Month #NDEAM | Service Coordination, Inc.
SCI & The Developmental Disabilities Administration (DDA) is proud to support National Disability Employment Awareness Month (NDEAM). 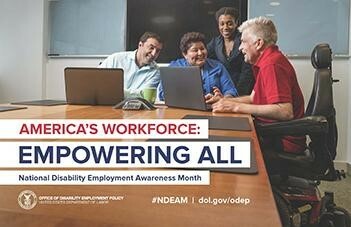 Held each October, NDEAM aims to educate the community about disability employment issues as well as celebrate and highlight accomplishments related to disability employment. Throughout the month, SCI and DDA will be engaging in a social media campaign highlighting disability employment issues. To get started, below are examples of social media posts you can use to get help spread the word , or feel free to customize your own. Please like and share the DDA posts using the hashtag #NDEAM.